Amidst severe backlash from the general public and monastic body on the Samrang mega-farm that was once conjectured to be a slaughterhouse even before any official affirmation, the previous government faced a difficult time convincing that there were no plans in line to turn Samrang mega farm into a slaughterhouse. For similar reasons, the ruling government even before they came into power strongly expressed their disapprobation in regard to the establishment of slaughterhouses and instead has plans to initiate a mega vegetable farm that will serve as a training ground for the farmers across the country. Given the raw sensitivities and political stakes surrounding the establishment of slaughterhouses in the country, the government has strongly announced that they have no intention to initiate such plants in country, however, the minister of agriculture, Lyonpo Yeshey Penjor said that if interested private individuals propose to establish a slaughterhouse in the country, the government cannot object to that. The minister’s comments come after an earlier interview to The Bhutanese where he had suggested taxation on local meat to discourage local slaughterhouses. His comments had attracted criticism and now this latest stand seems to be a softening of his more hardline earlier stance on domestic slaughterhouses. “The government will not initiate any slaughterhouses on its own but the government cannot also stop interested private individuals from coming up with slaughterhouses in the country. Moreover, going by the constitution, the government has no right to control interested private individuals from establishing businesses to enhance their livelihood. Be it through the import of meat or establishment of slaughterhouses, if the consumption of meat decreases, such businesses will gradually wane off, so it all depends on the market force and moreover, it is an individual’s right,” said Lyonpo Yeshey Penjor. The agriculture minister said that those wishing to establish slaughterhouses in the country have to meet the standard for animal welfare in Bhutan and other technical clearances laid out in the Livestock Rules and Regulations of Bhutan 2017. Tawchu Rabgay, the officiating Director General of the Department of Livestock said that as of now, no single proposal has been put forward by private individuals for the establishment of a slaughterhouse. 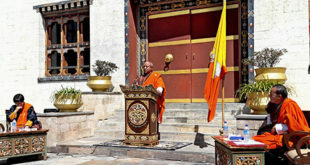 “Since we are production based, we cannot stop interested individuals from establishing slaughterhouses; however, they’ll have to comply with the Livestock Rules and Regulations of Bhutan 2017 and undergo numerous screening processes in order to be deemed fit to operate a slaughterhouse,” said Tawchu Rabgay. 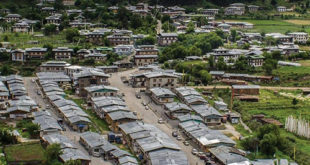 Trade statistics from the previous year showed that Bhutan imported meat and edible meat offal from India and countries other than India amounting to more than Nu 990 mn. Bhutan also imported fish and crustaceans, mollusks and other aquatic invertebrates worth Nu 179 mn, dairy products like eggs and natural honey and other edible products of animal origin worth more than Nu 1bn, and other products of animal origin worth Nu 2 mn. The director of Department of Trade, Sonam Tenzin said that since the subject of the establishment of slaughterhouses in the country has always been contentious, the department will issue the license for slaughterhouses in the country only after prior technical clearance from the Ministry of Agriculture and Forestry and other relevant ministries. “We cannot just look at the establishment of slaughterhouses purely from the business point of view — there are many aspects to it that needs to be considered while issuing the license and if the individual applicant has all the necessary clearance from department of livestock and other stakeholders, the department of trade has to issue the license anyhow. However, this is one issue that needs to be studied holistically,” said Sonam Tenzin. The terms and conditions of the Livestock Rules and Regulations of Bhutan 2017 state that an individual or meat processing plant shall ensure that animals slaughtered for meat purpose, or for disease control purpose, shall not be subjected to unnecessary pain and suffering. The animals meant for slaughter should be cared and managed, the slaughter of animals should be done humanely by stunning the animals using the appropriate method prior to slaughter, and animals awaiting slaughter should not see other animal being slaughtered. Pregnant animals will also not be allowed for slaughter for meat purposes and slaughtering of an animal for disease control purposes shall be done following the procedures prescribed by the ministry.